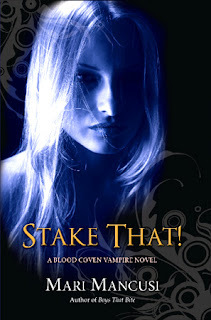 Hopelessly Devoted Bibliophile: Book Review: Stake That! Once again I read the book with the older cover, which I love, but this cover is equally beautiful! I think I'm in love with the blue. As much as I loved Sunny, Rayne is my girl. She's the incarnation of everything I love in a character! I'm rambling now, so I'll stop. Suffice it to say that this book series has me hooked! I've already finished the third one (review to come soon) and have the rest on my wishlist at the library and on my Christmas list. This is a series that I like to call my "guilty pleasure" and I'm not ashamed to admit it. LOVE!